See historic interviews talking about how we started - The Grill Sergeant on the Pentagon Channel in 2009 talks to Founder Ed Manley, co-chair Jesse Camacho and 11-year White House Chef Walter Scheib (Walter drowned in a hiking accident in 2015. *Stars and Stripes does 2012 interview with event co-chair about how we found a home at Marine Barracks in 2007. Congratulations to the 2018 winning team from the White House (2nd straight win for the W.H.) - CS1's Cameron Tirabassi, Alexandra Cross, Kara Gray & Lorenzo Singh. 2nd place was the Homeland Security HQ - CS1 Scott Jeffries, CS3 Chris Powell, CS3 Ward Brown, CS2 Noah Holbertson. 3rd Place was the Chairman of the Joint Chiefs of Staff - SSG Francisco Jaramillo, SSG Luis Irizarry, SGT Judy Luna, TSgt Andy Alvarez. Thanks to the IFSEA Kae deBrent Hodges Fund for covering student travel and $500 extra for the U. of Maryland, Eastern Shore students. This event coordinates with the Barracks Row Fall Festival, which attracts more than 10,000 people to 8th Street outside of the Marine Barracks and home of the Commandant. Prizes include $500 for each team member in first place, $250 each for second, and $125 each for third, as well as coins for each winner. The Metro-DC USO Salute to Military Chef's Dinner is magical, hosted by the very best, Elaine Rogers. Chefs from the top spots in DC work with the Ritz-Carlton Chef to produce the dinner. The WWE's Mark Henry and Chef Robert Irvine have played key roles in the past. The highlight of that evening is the presentation of the Veteran's Support Network's Armed Forces Enlisted Aide of the Year Award. The current year instruction comes out in August. 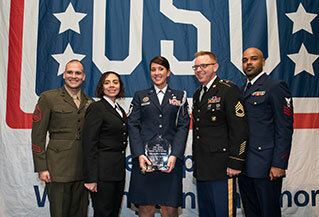 MSgt Jennifer Medeiros won in 2018, so Army & Coast Guard have won 4 times, Marines won 3x, Air Force 3x and Navy 2x. Robert Irvine. Best in each service, Jacob Parrett, Teresa Duson, Jennifer Medeiros, Matt Flemister & Michael Edwards. 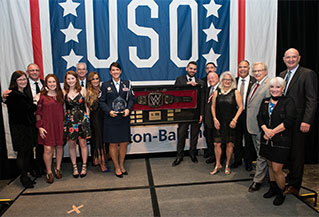 In the 2017 photo below (l-r) USO Metro DC President Elaine Rogers, Founder Ed Manley, USAF Jeff Fritz, USN Frida Karani, USCG Mason Champlin, USMC Jeffrey Mathews, WWE's Mark Henry, Chef Robert Irvine, Ecolab's Jack Kleckner, EAOY Army's Scott Strippoli, Board mbr. Jesse Camacho, Hobart's Richard Hynes. Winners, organizers and sponsors. "MSgt Scott Strippoli wins 2017 Inter-service Enlisted Aide of the Year Award." This event takes place at the Ritz-Carlton in Pentagon City. 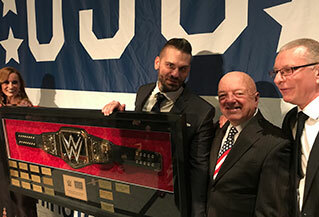 It is held in conjunction with the USO Salute to Military Chefs and is supported by the WWE. This can be a big deal for enlisted servicepersons' careers. Prizes include $500 for the Enlisted Aide of the Year and $250 each for service winners, along with a WWE Title belt.